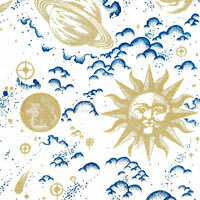 Celestial Designs in Deep Blue Cellophane Roll 24"x50'. Gold sun, moon, stars, planets and comets. Dark blue clouds on clear background.